On Easter Sunday, Patrick and I flew from Sydney to Cape Town. It was our first time in South Africa. We spent a few days training in Stellenbosch before heading to Cape Town for round two of the World Triathlon Series (WTS). I was excited to race and hungry to improve from my result in Auckland. We knew the water temperature would be cold in Cape Town; however, I wasn’t expecting to hear 11.6 degrees Celsius (52 Fahrenheit) when they announced the water temperature on race morning. The medical and technical officials decided to reduce the swim from 1500m to 750m because of the cold temperatures. Going into the race, I wanted a full 1500m; however once I heard the temperature of the water, I wasn’t complaining about the reduction of time I’d be in the frigid Ocean. After the 750m swim, we excited the water to complete an eight-lap 40km bike course, followed by a four-lap 10km run course. The gun went off a little after 3pm local time on Saturday, April 26. Diving into the Ocean was a shock to the system. I don’t remember much of the swim, but I exited the water in about 15th place and transitioned onto the bike. A front pack of about ten got away on the bike and I was in the chase pack when a crash occurred. I managed to avoid the crash, but I was then off the back of the group and riding solo between the chase and the second chase pack. I fought hard to stay in the race as I know the race isn’t over until you cross the finish line. I was caught by the second chase pack and a little over half way through the 40km bike course, our pack merged with the first chase pack forming one large chase group. The front pack of girls worked very hard on the bike, and they came into T2 over two minutes ahead of our group. I struggled to put my shoes on in T2 as my feet were still numb from the cold water. 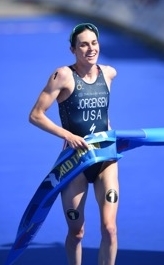 Once I exited T2, I tried to execute a good run and didn’t think about the time gap to the athletes in front of me. My legs felt heavy and slow, but I know feelings don’t have to dictate outcomes. I didn’t make up much time on the leaders until there was about three kilometers left in the race. By the fourth and final lap, I could see the podium up the road. I had no time to think. I put my head down and pushed as we ran into a headwind. I caught 3rd place and had my sights set on 2nd and 1st, however Jodie and Helen finished strong and I crossed the finish line about 30 seconds back. Finishing 3rd with a podium is great, but I did not complete all three disciplines to perfection. I still have some refining to do and I look forward to a race where I am able to execute in the swim, bike, run, and transitions. South Africa was a great place to visit. Usually when I travel to a race we don’t have much time to be a tourist; however, we had a few more days to enjoy the city this trip. Patrick and I enjoyed some local food recommendations (thanks, Liezel and Libby): bobotie, raw crocodile, braaivleis, ostrich, springbok, wines, chocolates, and more. We were spoiled when it came to food and I loved everything we ate. We also went on a safari that Gavin and Siobhan recommended. We saw the ‘big five’ (elephant, rhino, leopard, lion, and buffalo) and thoroughly enjoyed the drive to and throughout the safari. I learned a little about the lives of locals, saw many beautiful sights, and overall had a wonderful trip. I want to give a special thank you to the Specialized crew (Gavin, Bobby, JB, Dylan, and more) for showing us such a good time and for making sure we had everything we needed. Thank you to all my sponsors, fans, family, and training and support crews. I look forward to continuing to refine myself into a complete triathlete and I feel blessed to have so much support throughout my journey. Thank you as well for all the birthday wishes – I am very grateful for another year! I am now back in Wollongong, Australia, where I will spend the next couple weeks before heading to Yokohama, Japan, for round three of the WTS. Patrick went a little overboard buying four flavors of ice cream. We enjoyed every single one.